“The macaroni had been cooked in almond milk and sugar, and perfumed with ambergris, the finest ground cinnamon, genuine Corinth currants, pistachios from the Levant, lemon zest, the most delicate little salami, and garnished with marzapane….” is a description of a “macaroni pie” timballo di maccheroni that the French travel writer Pere Labata ate in Sicily in the early 1700s. 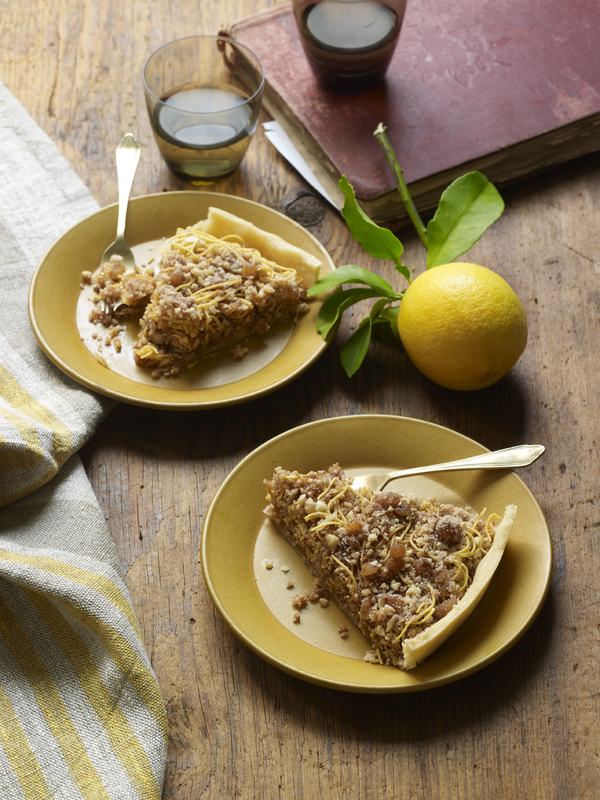 Italy has a long tradition of serving sweetened pasta like the macaroni pie Labata describes. Back in the Renaissance, pasta was a luxury food, reserved for special occasions, and paired with other luxury foods like sugar and cinnamon.. So pasta lovers can rejoice. Pasta can be enjoyed not just as a first course, but for dessert too! Pasta as a sweets course may sound trendy but Italians have been making all sorts of desserts with it for centuries. From cutting edge modern creations to traditional Torta Riccolina an almond-pasta pie from Emilia there are hundreds of sweets made with every shape of pasta from angel hair to ziti, plus dozens of dessert ravioli too. Want a change from the same old, same old? 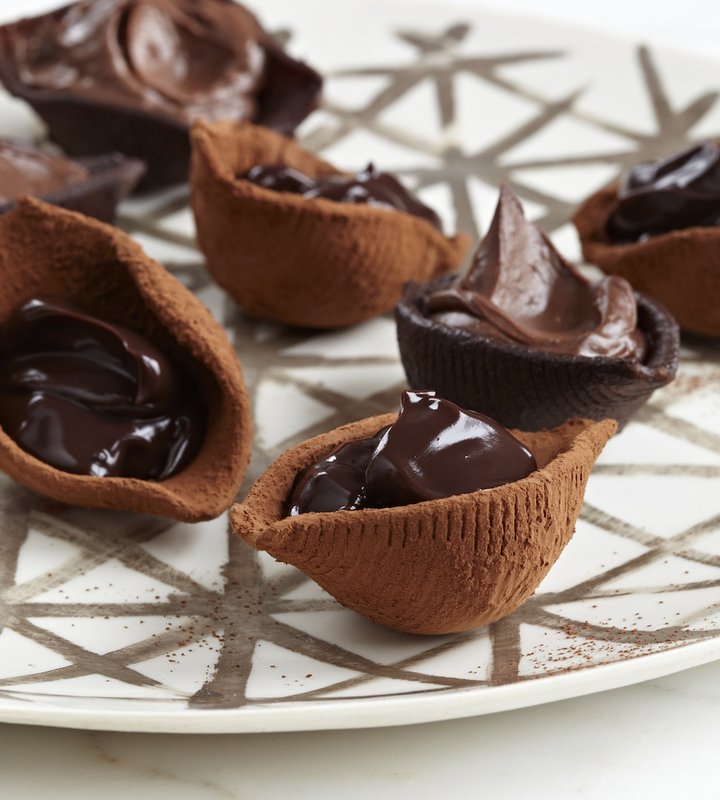 Jumbo pasta shells coated in cocoa is one of my favorites of the many modern pasta desserts in Italy today. Luca de Luca and the wonderful team at the Garofalo pasta company near Naples, taught me this recipe while I was in Italy researching my Pasta Modern. “Pasta shells can be filled with almost anything: vanilla custard, chocolate pudding, panna cotta, semifreddo, sorbet, granita, whipped cream and fresh berries, yogurt and honey …there are endless possibilities,” Luca explains. “Leave the gun, take the cannoli” is a popular line from The Godfather movie and cannoli are certainly one of Italy’s most popular desserts. As anyone who’s ever tried knows, making cannoli shells is a huge challenge. It’s hard even for the most experienced home cooks. But now there’s a fun solution: cannoli made with pasta instead! Mezzi maniche, “half sleeves,” little pasta tubes, are boiled then fried to create a crunchy, tasty container for the creamy sweet ricotta cannoli filling. They are a perfect pop-in-your-mouth, one-bite size. The fried mezzi maniche pasta are even good plain! Toss them in sugar and serve them with melted chocolate or with ice cream. In Italy they have a saying “Fried, even chair legs are delicious” Fritti sono buoni anche gli zampi delle sedie and certainly pasta is at the top of the list of delicious fried treats. There are fried pasta desserts in almost every region of Italy. 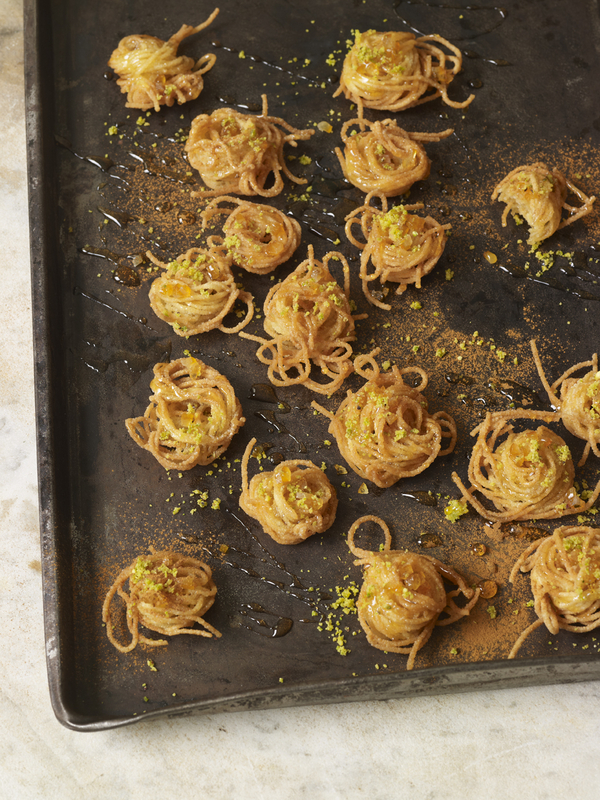 In Sicily they fry a little forkful of angel hair and serve it topped with honey and chopped pistachios. It’s like a pasta cookie, crunchy on the outside and chewy in the center. In Tuscany and central Italy they make a variation by frying thicker tagliatelle noodles nests, called nidi di tagliatelle per Carnevale. To make them a few strands of fresh egg noodles are clumped into a little nest shape and fried. Since they aren’t boiled first, they use only fresh egg pasta, not dried pasta, as its softer. In Tuscany the treat is made using chocolate noodles, made by incorporating cocoa powder into the pasta dough. The fried nests are drizzled with brandy-infused warm honey and topped with toasted almonds. In Emilia-Romagna they are served simply, just topped with confectioners’ sugar. Ravioli filled with pureed chestnuts, chocolate, espresso, rum and ground nuts, caggiunitte, are an Abruzzo specialty. 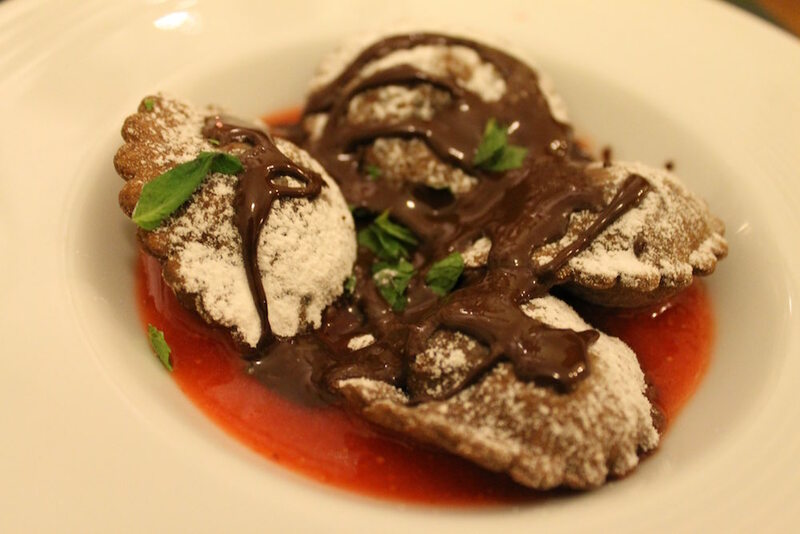 Lombardy’s specialty pasta dessert is fried tortelli filled with either jam or chocolate. I especially like the earthy combination of pureed chickpeas and jam filling in panzarotti con ceci of Puglia and Basilicata. Usually, ravioli can be tricky to make, because you have to get the dough very thin and seal them carefully since they’re going to be dashed about in rapidly boiling water like tiny ships in a storm. But because these ravioli are baked rather than boiled, you can make them thicker and don’t have to worry about them opening. A very easy to work with dough! To make this classic Bolognese dessert, you absolutely must use fresh, not dried, egg pasta. If making your own pasta seems daunting, buy ready-made fresh instead. Most supermarkets nowadays sell ready made fresh. A great make-ahead dessert, as it’s much better the day after, once all the flavors have melded. Grind the almonds and sugar in a food processor until it resembles coarse sand. Pulse in the zest, candied citron or orange peel, and cocoa powder until well combined. Divide into 3 parts. Preheat the oven to 350 degrees F. Line a 9 or 10-inch pie pan with the pie crust. Pot lots of holes in the bottom and sides of the crust with a fork. Divide the pasta into 3 parts, with one part being slightly larger than the other two. Line the pie pan with the larger portion of pasta and sprinkle with 1/3 of the almond mixture. Lift the pasta with the tip of a knife so it loose and free form. Do not press the pasta down. Dot the pasta with thin slices of the butter. Top with another layer of pasta sprinkled with a third of the almond mixture and more butter. Repeat for a third and final layer. Loosely cover with aluminum foil, bake for 25 minutes, then remove the foil and continue baking uncovered for another 20-25 minutes until the top is golden and the center set. Remove from the oven and immediately sprinkle the top of the pie with the rum. It will hiss and absorb quickly, with most of the alcohol evaporating, leaving just a lovely aroma and flavor. Allow to cool to room temperature. Serve, preferably after it’s rested overnight or for 24 hours, topped with confectioners’ sugar. Use just cocoa powder alone for unsweetened shells that become a gorgeous redish-brown color, or sweetened the cocoa powder with confectioners’ sugar for lovely dark-colored sweet shell. Using a teaspoon, fill the shells with anything you like. Pictured here is milk chocolate and dark chocolate pudding. Fillings & garnishes: approximately 2 cups total of gelato, custard, whipped cream, fruit, yogurt, etc. Cook the shells in lightly salted boiling water until al dente and drain. For sweeter shells, put the cocoa powder and confectioners’ sugar, to taste, into a sturdy plastic food storage bag. Toss the shells, a few at a time, into the bag until fully coated with cocoa powder. For less sweet shells toss them in just cocoa powder. Fill with anything you like. Try this recipe once, and like me, I bet it’ll become one of your go-to desserts. There are lots of ways to vary it. One of my favorite variations is to fill the fried pasta with mascarpone cheese sweetened with sugar and dust with instant coffee granules and cocoa powder, for a riff on tiramisu. In a bowl, using a fork, mix the ricotta, sugar, chocolate, candied peel and cinnamon until well combined. Refrigerate until ready to use. Cook the pasta in boiling salted water until very tender, about 1 minute longer than al dente. Drain the pasta well. Meanwhile, heat about 1 inch of oil in a very small saucepan until very hot, but not smoking. Add half of the pasta and fry until golden and crisp, about 2 minutes. Remove with a slotted spoon and drain on a paper towel. Repeat with the remaining pasta. When room temperature, roll the fried pasta in granulated sugar, then fill each with the ricotta mixture, either using an espresso spoon or by piping it in with a pastry bag. Garnish, if you like, with chopped pistachios, candied orange peel, grated chocolate or other toppings. Twirled forkfuls of honey-sweetened spaghetti, crunchy on the edges and soft in the center--- scrumptious and a snap to prepare. Cook the pasta in salted water according to package directions. Drain. Meanwhile, in a small bowl, combine the honey, orange zest or candied orange peel, orange blossom water and 2 tablespoons of boiling water. Put about 1/4 inch of oil in a small frying pan and heat until hot, but not smoking. Twirl small forkfuls of the pasta, drop them into the hot oil, and cook until golden and crisp at the edges. Turn, and cook on the other side for just a few seconds. Drain the pasta crisps on a plate lined with paper towels. Arrange the pasta crisps on serving plate. Serve warm, drizzled with the honey mixture and topped with a sprinkle of pistachios and a pinch of cinnamon. For the filling: Process the chickpeas through a food mill until you get a nice thick, smooth paste. Then mix in the jam and liqueur to taste. Stir in the zest and cinnamon to taste, and then add sugar or honey, if you like. Once you have tasted it and are happy with the flavor, then mix in the egg. You can make the filling several days ahead. Refrigerate until ready to use. To assemble: Preheat oven to 350 degrees F. Line 2 or 3 baking sheets with parchment paper. Spread out a large clean cotton cloth onto a work surface for assembling and cutting the ravioli. Leaving the rest covered, take a small section, about an 1/8 of the of dough, and either pass it through a pasta maker (#3 hole size, not thinner) or use a rolling pin to create a 3 to 4-inch wide strip of dough. Make just 2 strips at a time, so you can fill and cut the ravioli without having the waiting dough get dry. Lay a sheet of dough onto the cloth and drop a tablespoonful of the filling on the sheet, about 1 1/2 inches apart. Top with another layer of dough. Using your fingers, press the top layer of dough around the filling and using a ravioli cutter, cut out square-shaped ravioli. Repeat until you’ve used up all the dough and filling. Put the ravioli onto the baking sheet and bake for about 25 minutes until golden. 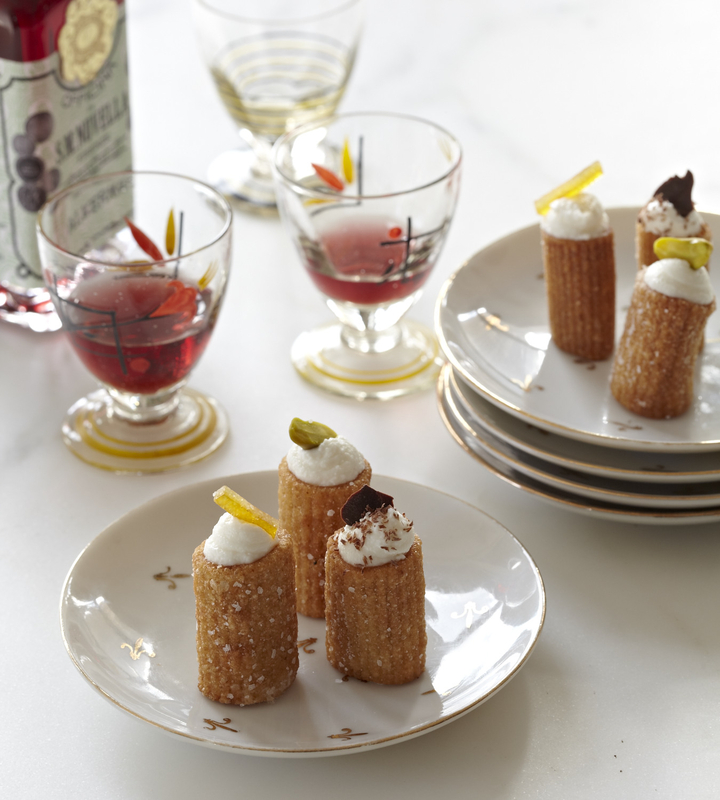 Eat warm, sprinkled with powdered sugar or cold dipped in honey or mosto cotto or vin cotto.